How do your region's ACA health insurance plans compare to other US regions? Is your state's uninsured rate higher or lower? What are the subsidy amounts projected across the nation? How do your health plan premium rates stack up? As more and more ACA data is made available, online tools are popping up to understand the data and understand the impact of the ACA. For example, I came across this interactive tool by Value Penguin on a Washington Post article. 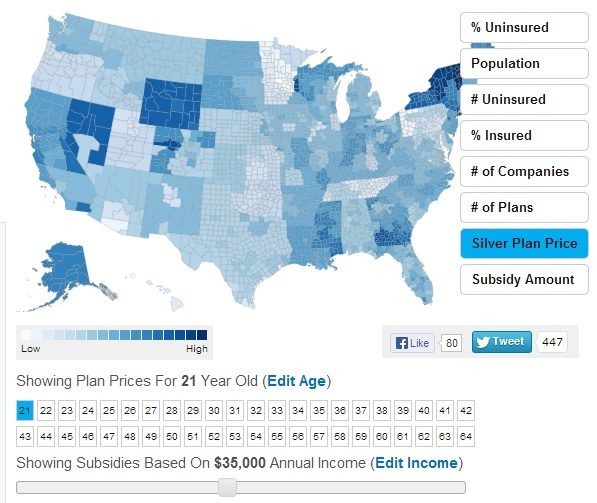 The tool "Visualizing The Uninsured And The Affordable Care Act" allows you to enter different variables such as age and income and see outputs on a county basis for uninsured rates, population, ACA health plan information, and premium tax subsidy stats. Data for the interactive tool comes from the Census, healthcare.gov, and the state insurance exchanges. Here's a look at the interactive tool. Click here to go to the ACA interactive tool. What types of ACA health insurance data or tools would be helpful to you? Leave a comment below and we'll see what we can find.